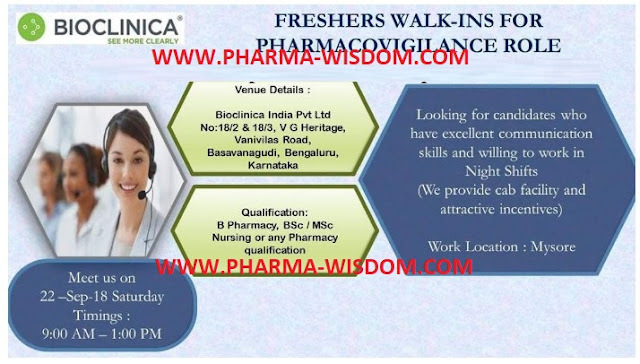 Bioclinica - Freshers Walk-Ins For Pharmacovilance Role On 22nd September, 2018. Candidates who have excellent communication skills & willing ton work in Night Shifts. Candidates have outstanding Communication skills and agree for work in night shifts.we provide cab facilities and incentives. Address details: Bioclinica India Pvt Ltd, No.18/2 and 18/ 3 , VG heritage, Vanivilas road, Basavangudi , Bengluru, Karnataka.